2. Click on the "Add Page" button. 3. On the next screen, select the type of page from the drop-down menu. 4. Select from the drop-down menu where the page will appear in the navigation menu. The Top of Hierarchy option makes the page a main page and displays it in the main navigation menu. Selecting to place it under another page displays the new page as a sub-page. 6. Type in a Page Name. 7. Click to add a check mark in the box next to [Is page active?] and next to [Allow public access?] to make the page visible to the public. 8. Click to add a check mark in the box next to [Pop up?] if the page should pop up in a new window. 9. Click to add a check mark in the box next to [Show in menus?] to add the page to the navigation menu. The new page appears in the website in edit mode. When creating a new navigation menu page, HotDoodle has several different options. Brand New Page - This option creates a brand new page that only retains the shared content from other pages. This new page is empty where there is no shared content. Copy an Existing Page - This option copies the page selected from a list of existing pages in the website. This option acts like the Copy Block operation. Link to Another Site - This option will create a navigation menu page, but when the page is clicked, the visitor is taken to the URL outside of HotDoodle that was specified for that page. 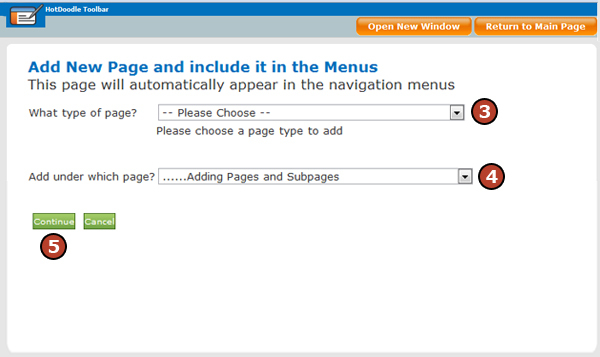 An Additional Menu Entry for an Existing Page - This option allows the same page to appear multiple places in the navigation menu and allows the renaming of the entry to appear as a different page name in the navigation menu, but it is the same page and it shares all content. Mirror an Existing Page, but with Different Page Properties - This option allows for a page to be mirrored with the page properties to be different in each version of the page. 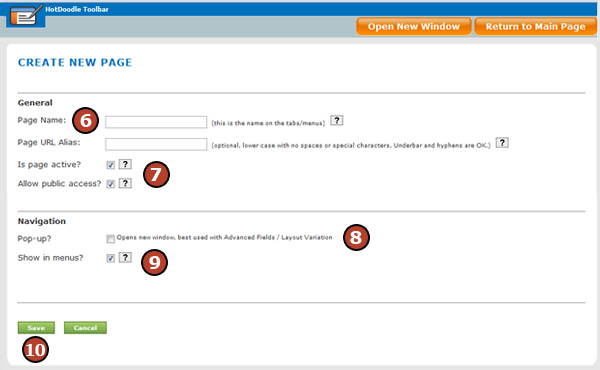 (Example: Multilingual websites where page names with change for each language) This option allows for a page to be created with conditional content like language specification and for the page to display different conditional language content depending on the link that was clicked by the visitor.